Tagman can analyze the MP3 audio files you select or it can search for and analyze all your music files. By doing so it can find and fill out missing tags. This sort of functionality comes in very handy if you have a large music library and you want to keep it organized. Support is provided for any Windows edition from Windows XP onward. Please note that 32- as well as 64-bit Windows editions are supported. As expected, a setup wizard will help you install Tagman on a PC that runs a 32- or 64-bit Windows edition. Analysis – instruct Tagman to analyze all music files or certain music files. Settings – play with several options that govern how Tagman works. Help – open a PDF manual that nicely describes what Tagman can do. It comprehensively presents Tagman’s interface and Tagman’s functionality. Speaking about functionality, here’s a list of features and functions: analyze all the music files stored on a certain drive; analyze files from a certain folder; load certain music files and analyze them; automatically fill missing tags; manually edit tags; built-in audio player. Tagman is not free, it is only free to try. This means you can use it for evaluation purposes for a trial period of 30 days; the trial will recognize up to 500 songs. Manually edit MP3 audio tags or have Tagman recognize songs and automatically fill out the missing tags. 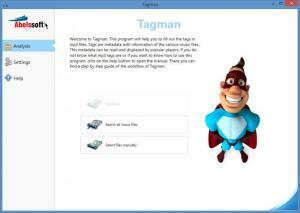 There’s nothing complicated about installing Tagman on a Windows-powered PC. Tagman’s interface is very easy to use. Tagman can analyze all music files stored on a certain drive; Tagman can analyze music files from whatever folder you select; Tagman can analyze whatever files you manually pick. Tagman can automatically fill out tags. You can manually edit audio tags. There’s a built-in player that you can use to listen to songs. Trial limitations: 30-day trial, 500 songs limitation, nag screen. You can download Tagman free here.